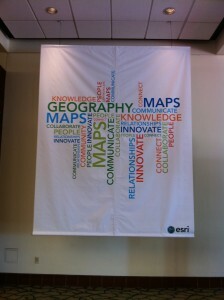 I’m back from the sixth ESRI DevSummit. It was a great event full of informative sessions, socializing and networking. This was one of the first conferences in a while where I did not participate more than simply attending. The DevSummit is truly for devoted developers and while I do some development, it’s nowhere near what I could call full time. Many of the user presentations were incredible displays of GIS geekery and I’m still in awe with what some people are doing with the software. The second complaint was on the first day; the pre-summit workshops focusing on Mobile, Web APIs and Python. The workshops were geared to developers looking to expand their knowledge into a different field. I think many were expecting a workshop focused on a moderate- or expert-level developer in the field. The afternoon two got the brunt of the complaints; I walked past Python to go to the Web API session and it was standing room only. Web API was full, but seats could be found. About half way through I bailed and went into the Python session and easily found a seat. It’s safe to say the seats were only 60% full at that point. And I too bailed to check out the Expo and Demo Theaters. If you never touched Python & GIS at the same time, it would have been valuable, otherwise it was very beginner. That’s not to say that Monday was a disappointment. I thoroughly enjoyed the morning’s Mobile session; prior to the conference I had no real experience with ESRI’s mobile APIs outside of some old ArcPad dealings from a few years ago. The mobile world has changed greatly and ArcPad or Trimble TerraSync are entirely different animals than the tools and the user experience offered by applications on iOS or Android. It’s amazing how on each of the platforms you can have a simple app running in minutes. I’m going to pick up a book on Objective-C and try my hand at a basic mapping app on iOS. Tuesday’s Plenary was a great orientation informative. 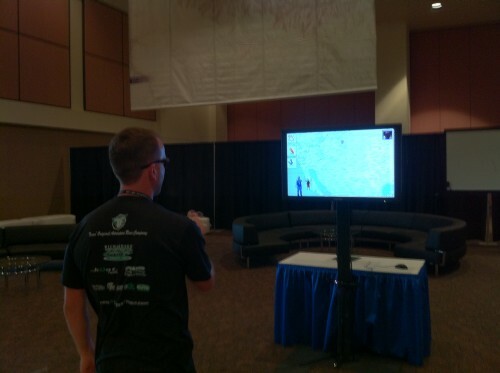 A sample of each of the conference’s tracks was presented, many with impressive demos. Two presentations clearly stood out amongst the rest were Tim O’Reilly‘s talk and the Kinect demo put together by Morten Nielsen. Scott Morehouse, the lead developer, presented without really referring to slides. From a presenter’s point of view, I can see the reasoning for wanting to have slides; they are helpful to keep you on point. Morehouse was incredibly engaging because he got right up there and talked to us. That and his beard is awesome. I am disappointed that I missed out on the Code for America sessions. I foolishly did not cancel my classes, opting to Skype back in for some of the session. I think my students wouldn’t have minded having a class cancelled and I really regret not attending the session. Thankfully, all of the presentations will be posted to the web soon. The Keynote on Wednesday featured Michael King from Gartner. He was a last minute replacement for Bill Clark, who was ill. Michael focused on the mobile platform and location-based services. While I agree with most of what was said, I still feel that his talk would have resonated more strongly with the upper level management of those in attendance, as he focused more on market penetration of mobile devices. The term “qualified eyeballs” caused a bit of a stir, as I doubt many of those in attendance care strongly about marketing. While many developers often don’t consider aesthetics or usability, leaving it to a graphic designer or marketing, Kirk Van Gorkom‘s talk on User Interface design was incredibly well received. It was a packed room and very well received. I would have fought my way into the room, but knowing the panels were recorded and would be posted to ESRI’s site, I am anxiously waiting to watch his talk. Brian Flood discussed using Google’s Fusion Tables to provide data to an ArcGIS Server instance. SpatialDataLogic has been doing some amazing work to extend ArcGIS Desktop, allowing Desktop users to leverage Google’s AppEngine and Amazon AWS and produce web maps and services without the need for ArcGIS Server. His latest work with Fusion Tables was one of the few talks I felt completely out of my league. Google’s technology is years ahead of what is currently in production environments for most developers and companies. I was initially looking into Fusion Tables as a basic tool for instructing my students on how to work with data, but now I’m going to take a more in depth look (and hopefully not get lost) and see if we could use it in some of our research projects. Jim McKinney really deserves a lot of credit for his presentation skills. His morning session, “ArcGIS 10.1 and the Road Ahead” had A/V issues, so he just spoke to the crowd for about 10 minutes while others scrambled to get the projectors working. Then, at the Closing Session, essentially the same problem occurred – no slides. Of course, this time it was in front of everyone, but he still handled it well. And by the end of the day, you could tell that whatever cold or sore throat that was plaguing him was really starting to wear him down, but he kept going. Anyway, at the morning session, it was great to see what’s slated for ArcGIS Desktop 10.1. There’s some exciting new features coming that should benefit both introductory and advanced users. Despite this, the focus of the conference was on mobile and web applications, not extending the desktop. While there are still some custom applications based on ArcView 3 still out there in the wild, it’s clear that ESRI is emphasizing ‘Net-centric technology. 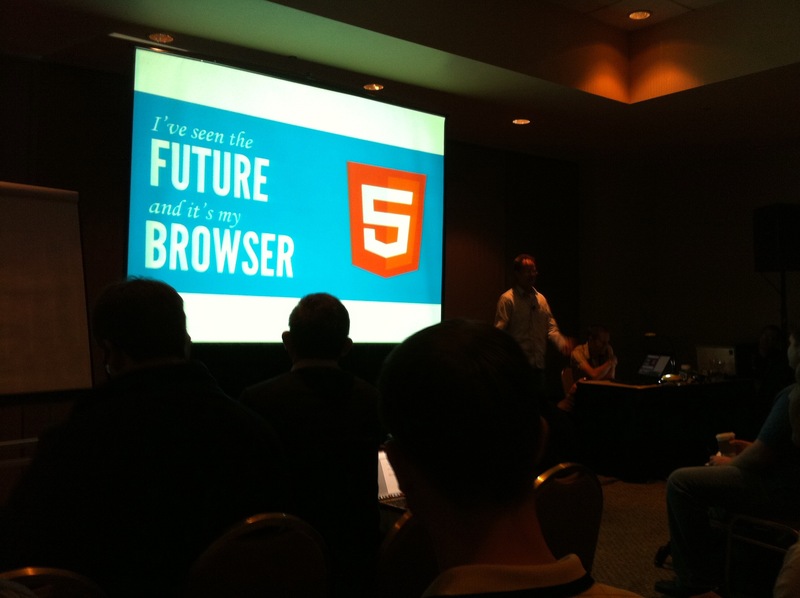 Dave Bouwman‘s talk on HTML 5 was a great ending to the DevSummit. I was getting tired of hearing about how Flex and Silverlight are going to write themselves into great applications that’ll work everywhere. I feel ESRI isn’t putting enough energy behind HTML5 and the JS API. It was great having Dave provide us with some really amazing demonstrations of what developing with HTML5 can produce. He showed off WxMappr.com, a simple demonstration of how HTML5 can produce a map that works well on the desktop, a tablet and a phone. Dave’s group, DTSAgile, also produced a very handy mobile application that functioned as a guide to the sessions. DevSummit was an amazing event. I left with some great ideas I hope to implement back at the University. 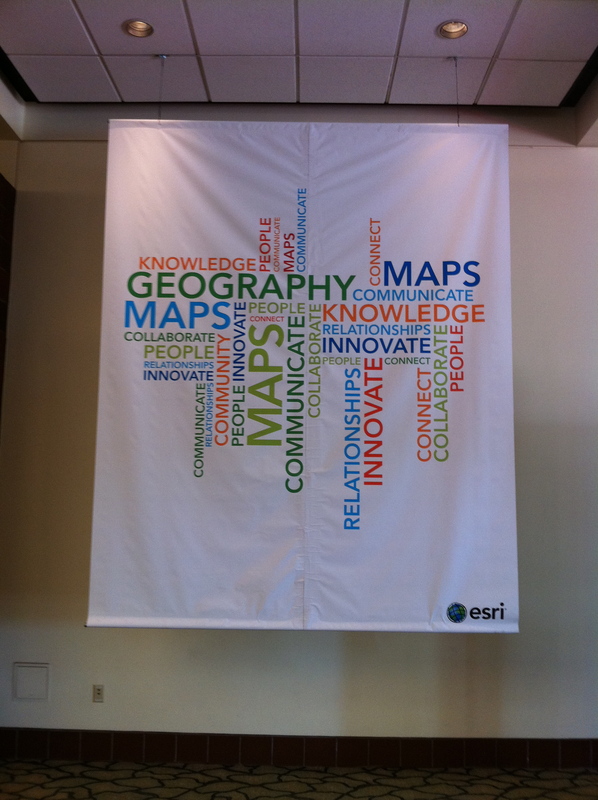 As soon as ESRI posts the session videos to their event website, make sure you check them out. I’m going to definitely rewatch some of them and catch ones that I missed. Also, I’ll update this post with links to the videos of the talks mentioned, once they’re live on ESRI’s site. This entry was posted in Conferences, ESRI, Events, Technology and tagged ArcGIS, Development, DevSummit, ESRI, GIS, mobile, Software. Bookmark the permalink. Amazing summary John! Many thanks for the time you put into writing this. Any news on advances in geoprocessing? I am still surprised that the capability to perform basic geoprocessing tasks on moderately sized datasets has not changed at all in the last decade. Two weeks ago I had to go back to ArcINFO workstation to run a dissolve that repeatedly failed in ArcGIS Desktop. We stopped installing ArcINFO workstation in our teaching lab two years ago, but with students working on larger and larger data sets I am working if we need to bring it back. It seems there is lots of talk about serving data to the web, and not so much talk in how we are going to analyze that data. Maybe it’s Fusion Tables? I’m glad I’m not the only one out of my depth – but it’s good to be challenged by awesomely clever people. I agree with more or less everything in here, but I would go further and say Monday really was a disappointment. I can understand ESRI is catering to a large population of developers with a different levels of skill/experience, but I can’t recall anything particularly enlightening on Monday, particularly compared to Thursday/Friday. I feel like that time would have been better spent bugging ESRI folks in the main room or sneaking into the partner conference sessions. I agree, this is a super summary of the Dev Summit. I highly recommend the Plenary videos to anyone who only has an hour or so to look into this stuff. @Jarlath, what version of ArcGIS Desktop are you using? Dissolve had some major issues pre 9.3. Also, dont get too attached to Workstation, at the Dev Summit, someone said it was going away soon 10.1? 10.2? Great review, I’m sure DevSummit’s Plenary videos are worth looking into.